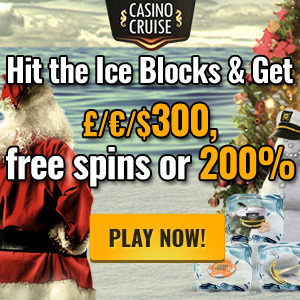 Casino Cruise Xmas Free Spins 2015 Advent Calendar: The best biggest bonuses on the planet! Casino Cruise has launched their Casino Cruise Xmas Free Spins 2015 Advent Calendar for the holiday month of December 2015, from 1 December until 31 December (GMT). 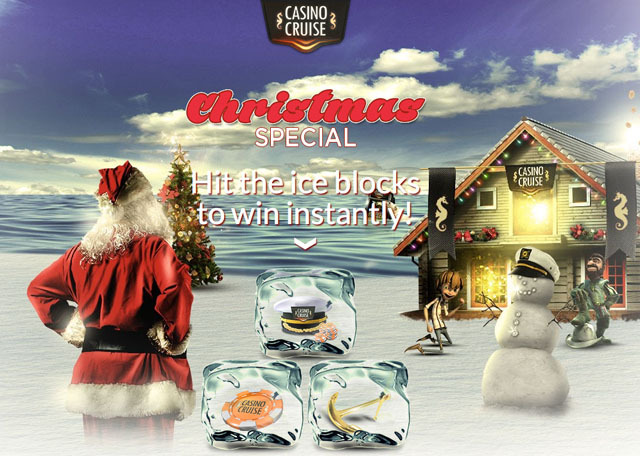 Win instant Xmas gifts with Casino Cruise this festive season. How do I get my Christmas Special this December 2015? All you need to do is open up a casino account (if you haven’t yet done so), and accept one of the following Welcome bonus offers below, to be able to gain access to the Christmas Special. The Christmas Special landing page allows you to break open some huge ice blocks. You get three chances, and can choose the gift that is most suited for you, whether it be free spins or additional bonuses. Get triple the amount that you deposit. For example, make a deposit of £/€/$20 and get a £/€/$60 bonus, and begin playing with £/€/$80. Note that this Exclusive offer is only available through using the links on this page. Once you have signed up for a casino account, you will be able to select this offer in the CASHIER tab. You will receive 100 Starburst free spins and 24 Lights free spins when you make a deposit. If you are an existing player, you will also be able to get free spins, bonus offers, as well as other awesome prizes in the month of December 2015. All you need to do is visit the casino site and crush the ice to reveal your prize each day. 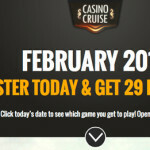 Only one person, IP address, email address may sign up for ONE casino account. Players from these countries may NOT play at Casino Cruise: Hungary, China, Bulgaria, Poland, Ukraine, Turkey, Romania, Lithuania, Belarus, Latvia, and Czech Republic. The wagering requirements for free spins winnings are 40x and must be fulfilled before any winnings can be withdrawn. 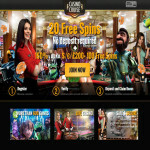 All free spins will be credited the following day by 12h00 GMT. 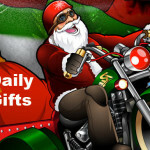 All free spins are eligible for use on Fruit Shop Christmas Edition slot. *The following Classic /Video slots will contribute 20% towards the wagering requirements: Blood Suckers, Kings of Chicago, Dead or Alive, Devil’s Delight™, Mega Joker, The wish Master, Champion of the Track, Robin Hood, Scrooge and Jackpot 6000. The maximum bet allowed when playing with bonus money is £/€/$5. This Xmas promotional offer runs from 1 December 2015 until midnight on 31 December 2015 GMT.